Sophie Thimonnier has created something very special. 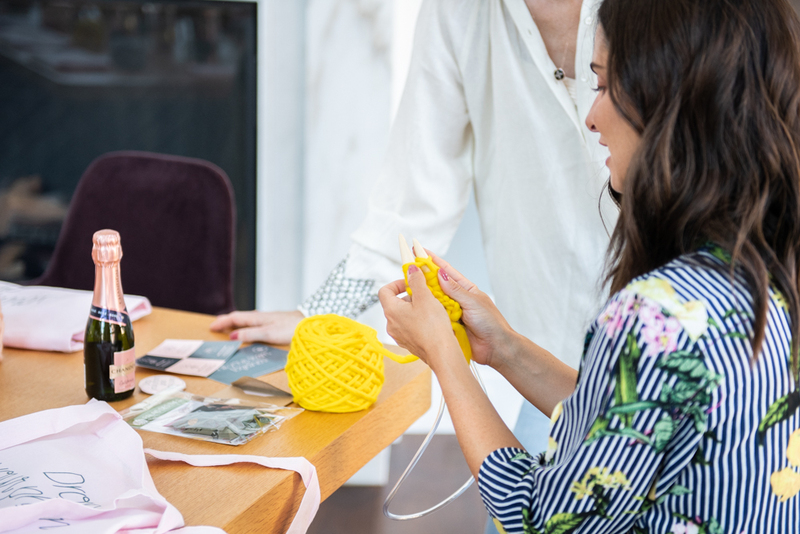 She transfers her positive, soulful, peaceful energy on to everyone she meets, so it was of no surprise that her newest venture, HeartKnit, a class dedicated to taking a break from technology and bonding over handmade creations, has become a big success. Sophie teaches group classes on how to knit with beautiful, colorful yarn, decorated with soothing florals and herbal teas. The event she creates allows women to really connect with one another, while honing in on a new skill, in an environment with no distractions. Similar to meditation, the experience is therapeutic and has been scientifically proven to have health benefits, giving its participants clarity. In my opinion, this is something we all need weekly, as we sometimes forget that life exists beyond our phones. What inspired you to create Midheaven? Midheaven was inspired by all the women I would meet who were tall like I am. It was a constant topic of conversation: jeans for tall women! "Where did you get your jeans? Ugh, I can never find them long enough...." I grew up to be very tall, very fast. I kept getting taller, and my pants kept getting shorter. I couldn't find a company out there that I could be loyal to, that would always have a selection of on-trend, beautifully made garments that were customized for women who had a taller than average frame. I really wanted to create a line of denim for others out there who cared about not only length, but who cared about fit and quality also. I had been marinating on the idea of creating this product for some time, when I happened to run into a neighbor of mine. We got to talking and it turned out she had been in the denim world for 30 years as a manufacturer. Her and her husband got out of the business in 2008, but still had all their contacts and offered to show me around and introduce me to their old factory, production manager and pattern maker. I started by making one pair of jeans: a mid-rise flare with a 38" inseam, something I hadn't been able to find in the right length. That pair of jeans took me 1 year to perfect, and during that year I learned as much as I could about the process of bringing a design to reality from start to finish. I kept going, and created three more styles with that particular team. During that time, I came up with the name "Midheaven," and decided to launch those four products as a small collection specifically for tall women, and advertise this would-be business on social media. We launched in January of last year and haven't looked back. What has been the biggest help for brand exposure so far? Instagram! What a powerful tool instagram is. We live in a world where everyone is so connected and we are able to bring forth our creations and expose those creations to a wider audience in a short period of time than was ever possible before. Not only am I able to target my specific demographic, but I am able to communicate with my customers and ask them what they would like to see next. That communication and access to my customer is invaluable and is solely because of social media. What differentiates your denim brand from others in your market? Most of the denim brands focus on the widest audience possible which means AVERAGE. Unfortunately, many of us fall outside of the "average" sizing scale. Midheaven caters to a very underserved demographic: the tall woman. While we carry product that a not-so-tall woman would absolutely love also, we really wanted someone to be able to shop Midheaven no matter how tall they are. We also carry plus sizes as well, so that no matter your figure, Midheaven will have product you can depend on that is both made to fit beautifully and offers a wide variety of styles for different body types. How has your new baby motivated and inspired you to create? Westlyn is a huge inspiration for me to go for my dreams and continue to create, no matter what. She is constantly moving, constantly laughing, constantly excited to see new and different things and people. I feel like my inner child is expressed through her. I don't ever want to allow my life to get so complicated that I stop doing what I love and being creative on every level. I love working hard. I love challenging myself. I love newness and exploring and educating myself. Business is so interesting to me, and in the beginning, I knew NOTHING about business. I loved the challenge and have learned so much not only about what it takes to run a business, but I learned so much about myself also. I want her to be proud and to see that her mother sets goals and achieves them. And when she is older I want her to understand the premise of Midheaven: that it is about confidence. Fashion is expression, and what we put on our bodies should help us express how we feel on the inside. My goal for Midheaven was to help women feel comfortable and confident in their clothes and that inevitably impacts how we operate. I like the positivity of the message and I like that Westlyn's impact on me as a mother and as a woman is absolutely part of each step we take in growing this business. Stella McCartney - she is a pioneer in the sustainable fashion space and that is so inspiring to me. We source our fabric from Candiani, which is the greenest denim mill in the world. I don't think you can work in this business, or simply be a consumer of fashion without looking at its impact on the world and the environment. In building this company, I really wanted to make sure that I wasn't being reckless in trying to minimize my footprint. We pay a lot of money to get our fabric here from Italy, and the reason why we do that is because of the way the mill is aiming for sustainability as well. Their cotton is responsibility sourced from the Better Cotton Initiative and all of their waste products are recycled from their spinning, warping and dying departments. I am always researching ways we can improve our processes as a whole and what we can do to explore more sustainable means of production. We very much respect other brands who are doing the same. What values do you hope to instill in your child? I would love to teach her that being respectful and honest is so important in everything you do in life. Nothing is worth cutting others down for. We are living in such a beautiful time where women supporting women is being spotlighted and encouraged. I want her to feel the impact of the work that is being done right now and know in her bones that you give what you get. If you give support and love and encouragement and genuinely feel happy for others when they achieve their dreams or hit milestones in their endeavors, she will get that energy back in spades. I also want her to feel connected with her spiritual life. I am religious and very spiritual. It has taken me a long time to find stride with my own personal spiritual journey. I was very encouraged by my mother to read as much as I could, to research as much as I could and think and explore and find my own connection to God as I felt truth in. I want to pass that on to my children as well. Taking a hike up Runyon Canyon or any hiking in Malibu and Santa Monica... going to the beach or going to the Santa Monica pier and playing video games or walking to the very end and watching the fisherman... Taking a bike down the Venice boardwalk is definitely a weekly activity of ours. We also recently brought "Bean" (Westlyn) to the Getty Museum to see Sally Mann's exhibit. She absolutely loved it and stared at each piece we strolled her in front of. Highly recommend. I would absolutely love to do a collaboration with a bathing suit company. My customers are always asking for bathing suits (mainly one-pieces) that are designed for taller women. I would love to do activewear too, which is actually in the works with a brand we cant reveal yet (yay!) Also, Cynthia Rowley is pretty amazing and has been one of my mentors since the beginning. I would love to do a pair of jeans or two with her at some point. 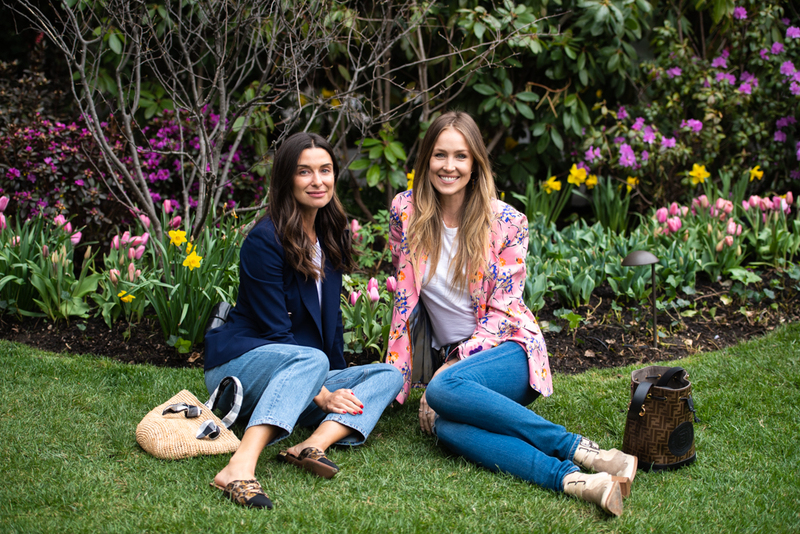 Jasmine Snow was an accessories editor for 8 years, and style is her nature. She, like many other women, couldn’t understand why there were so many unattractive bib options for her new baby when she first became a mother. She would purchase these adorable outfits for her baby, and spend all of this time dressing her up, and then slap on these colorful, printed bibs the second they got to a restaurant. She wanted to create a chic and unisex option, a forever baby accessory, and The Black Bib was born! This black leather bib, much like a great leather moto jacket, looks great with any outfit, and isn’t distracting. They are totally baby-proof, and can be cleaned with a wet wipe. My girls, even at this age, get very messy, so I’m waiting for Jasmine to make a few in their size! When my sister’s dear friend, Jennie Monness started her blog Mo’Mommies, I was thrilled for her, as she dedicated her life (pre-parenthood) to studying childhood development, and was probably the most prepared mother-to-be I knew. I loved the philosophy behind her play-based methods, and her blog helped her create an actual physical space for babies and children to come learn. Union Square Play is a new play-space which offers drop-in classes throughout the day where children are encouraged to explore the environment and find activities that foster their curiosities to expand their development. There is a beautiful community of parents that have found each other through their children in USP, who have created a very nurturing and supportive culture, that is unique and special. Jennie has also brought on one of my personal favorite activities, playAGAIN with Lisa Zaretsky, who now has a permanent space within USP, so go say hello for me! We were very excited and honored to be featured in our favorite parenting publication, Mini Magazine. It was fun taking the opportunity to be self-reflective in answering their interview questions. The girls were giving me so much love in our shoot with Ana Gambuto, I didn’t want it to end. I appreciate the magazine capturing the authenticity of our home and family life, and creating such a beautiful spread that I’ll cherish forever. Visit their website to view the full issue along with my interview. As we can all tell from my Instagram account, I have two very theatrical daughters who love the performing arts. When I was little, I volunteered for every play offered between camp and school, always hoping for a lead role, as singing dancing and acting were my passion. I’m happy to have found Broadway Bees, a short-term summer camp program that runs weekly, in Manhattan, the Hamptons, and Greenwich, supporting children’s acting skills and assisting with confidence building and public speaking. I believe that enrolling children in programs like this at a young age will facilitate strength and risk-taking, even for children who struggle with speaking up and voicing their opinions in the classroom. This program was founded by Valentina Berger, a Broadway veteran, who has worked as a producer in the industry for years, and I’m excited for the girls to try it out. Way back when, when I was pregnant with my first child, approximately 7 years ago, there was only one shop I loved, and it was Giggle in soho. They were a small boutique, where I ended up befriending my regular salesperson, because she was just the coolest, and it made the search for the endless newborn products easy and enjoyable. They were well-curated with only the best products and furniture on the market, so even if you were new to the baby game, you kind of couldn’t go wrong in this shop. I remember walking into stores like Bye Bye Baby and feeling so overwhelmed by the sensory overload surrounding me, I’d literally run out the door. I was sad to see Giggle go a few years back, even though I was past that phase of life, however they are now under new ownership, back as an online store, and better than ever! Erin Moennich has found all of the best baby products and will even be starting her own line to add to her site. She has a very well-curated layette available for purchase and has partnered with Darian Ablon to create a quality private label collection of children’s pajamas and clothing at affordable prices. For all of you new Mamas out there, this will be your go-to for all things baby. As many of you know, I have a real affinity for vintage clothing and accessories. As the years have gone by, my collection has grown to be too large for my apartment, and I finally found a good place to sell it. Vestiaire, a platform for buying and selling used clothing and accessories, that specializes in vintage apparel. They have a tremendous collection on consignment from various collectors around the world, as they started a decade ago in Europe and have more recently opened up their site to the US. We all know about the Real Real, but Vestiaire has been providing this service as well, and their stylists curate a truly beautiful, chic online boutique. Manon DeFelice is a woman I admire. She has taken my mantra of women supporting women to the next level, opening up her recruiting company almost five years ago, catering to women requiring flexibility in the workplace. There are so many brilliant, talented women out there who held important positions at work but left after motherhood, and never felt empowered or encouraged enough to return to their previous employment because they wanted to be present for their new families. This is a challenge I see even with my own group of friends, who would love the opportunity to launch a company or assist in building a start-up, but feel it would take too much time away from their children. Manon created Inkwell with these women in mind, and helps place women in the work force who need to work remotely, or have a shortened work week. Flexibility is the foundation of her business, and she provides financial rewards to the clients who give referrals. Her business is what supporting women is all about, so if you are feeling the itch to get back in it, shoot her an email. There’s a new shop in town, and you all need to know about it. As busy women, whether attending work events, social gatherings, or philanthropic functions, we have a lot of occasions that require evening wear. This can be an extremely expensive endeavor, as well as wasteful, since the likelihood of wearing that memorable, special piece to multiple events is slim. We all like to feel confident and beautiful, and we deserve to be able to wear many important dresses and gowns, at a much more affordable price. Nova Octo is a place where you can find all of the most luxurious designers, even some you’ve never seen or discovered in the states, and rent them for a small fraction of the price to wear to an event. The entire experience from start to finish is glamorous and fun, and owner/founder, Silje, is very accommodating to her clientele. For each rental, Silje gives back, making a donation to the client’s charitable organization of choice. She has a great eye and a kind heart. I love finding new great workouts to incorporate as a complement to my regular Tracy Anderson regimen. A close friend of mine, who has the best taste in just about everything, turned me onto a new private training studio on the Upper East Side called Boaz Studio. Boaz and his trainers customize the workout to suit your body’s needs, and really build strength and tone the body in a way that lasts long-term. I love the vibe when I walk into the studio, a beautiful townhouse just off of Madison Avenue, with the best old school rock and roll music. The sessions with Boaz go so fast, I hardly feel like I’m working out. He makes the strength training enjoyable, and has a great way about him, which is why his clients always return. I’m very excited to try out his new boxing studio which will open soon on the first floor, bringing a new element to the workout. Dr. Jake has been a close friend of mine, and for years, we’ve discussed him launching a concierge practice, in NYC to cater to an entire family’s health needs, from pediatrics to adult care. Jake has been an ER Doctor for over a decade, so he has dealt with everything and anything you can possibly imagine, and loves his job. He is the doctor we all dream of, incredibly precise, brilliant, kind, thorough, with the most charming bedside manner. So, imagine that coupled with 24/7 individualized care for any wound, infection, virus, or unknown illness! I’m constantly getting emails and calls from friends wanting a doctor who comes to their home, as busy moms are multitasking with work, and constantly on-the-go, therefore very susceptible to illness. Oakwood Concierge http://oakwoodconcierge.com is all about convenience. Using telemedicine, Dr. Jake makes it possible to triage, diagnose and treat without the traditional office-based practice. Additionally, he has at-home lab testing such as phlebotomy and prescription delivery services! For more serious conditions that require x-rays or surgical procedures, he also has his Manhattan offices available to his lucky roster of clients. I’m not sure if any of you experience your husband’s or partners avoiding the doctor completely, like I do, but this service offers such a great solution to keeping them healthy, without having to leave the office or home. Dr. Jake is literally changing healthcare with a more progressive approach, one that truly meets the needs of the modern family. As Valentine’s Day is quickly approaching, a holiday I now only celebrate with my kids, I wanted to bring back the romance of the the day with this feature. Jane Winchester has been in the accessories business for decades, and has now launched her own brand of jewels inspired by the gypsy coins of the 1900s. The reason for this inspiration, is that she sought out to create pieces with meaning, pieces that last a lifetime. Each amulet Jane creates symbolizes positivity, strength, hope and luck, to be worn daily as a constant reminder. Jane is passionate about her product, and making sure that each piece expresses the important, personal milestones in her customer’s life. It’s a true feel good gift! Remember the game Telephone? I loved Telephone. Hearing a secret, telling a secret...I guess I still love Telephone, I love secrets, and everything about them. I find that people listen much more carefully when you tell them a secret. Something I know to be true, is that any friend of mine, with envy worthy skin has a secret — the very same secret, at that. One by one, this secret gets passed along, like the game of telephone. Now, put your ear to the screen and listen closely because I wouldn’t want you to mishear what I’m about to reveal. Biologique Recherche Lotion P50. It's been rumored to be “magic in a bottle,” or “the holy grail.” I’ve even heard musings that it has a “cult-like” following. Now, I too, have drank the kool-aid, and have never been happier! Is it a toner? Is it a lotion? Where can it be purchased? What is the smell? Why does my skin look so good?! All valid questions, although slightly irrelevant when flawless skin is achieved. There isn’t much that P50 doesn't claim to do. Exfoliate, reset PH balance, cellular regeneration, hydrate, minimize pores, cleanse, tighten fine lines, taxes, school drop off… the list goes on! After personally experiencing, softer, blemish-free, hydrated skin (as well as almost everything else on the list), and in record time I might add, I was as curious as ever; what the heck is in this stuff!? Generally, I understand a product by its name or category, but P50 lotion, that is used more like a toner, still leaves me curious. Which brings me back to this simple thought … does it matter with results like this? I’ll let you decide! Eyebrows are the focal point of a face, according to ME! I’ve always been obsessed with eyebrows, because, if done well, there is truly no need for makeup, they brighten a face all on their own. Everyone who knows me well, knows that my brows get the most maintenance of all; they are trimmed, plucked, and arched once a month! I’ve gone to my dear friend Paulo for years, but so many people uptown ask me for someone who is comparable in their neighborhood, and I found someone great! Sabria Celaj works in a salon on the upper east side, and does a beautiful job shaping the brow, appreciating my same aesthetic. I found that when she worked on my eyebrows, the experience was very relaxing, as she has a great energy and her positivity comes through.